To a great extent, commerce runs on contracts. In a business-to-business (B2B) agreement, a contract is simply a legally enforceable assurance that both sides will meet the terms of the agreement. If Company A fails to meet its contractual responsibility to Company B, Company B can ask a court to compel Company A to meet that responsibility or face legal consequences. But, as Central Florida business lawyers, we know it’s seldom that simple, especially when two businesses enter into a contract. It’s often hard to determine how someone else will interpret a particular phrase or provision. This is where the counsel of a knowledgeable business contract attorney is priceless. A clear, precisely-drafted contract protects you and your profession – as well as the other party – by preventing any misinterpretation. Businesses in Central Florida should partner with an experienced business attorney who can help you draft, understand, and negotiate contracts, in addition to representing your interests in any contract dispute or business litigation. Headquartered in Daytona Beach, contact the Florida business contract attorneys of Lankford Law Firm. Call (850) 264-7004. There are no “simple” B2B contracts. If you operate a business, never enter into a contract without seeking the legal advice and counsel of an experienced business contract attorney. Don’t use or download pre-printed contracts, either. Your business is unique, and you should enter into only those contracts specifically drafted to cover and meet your unique needs. 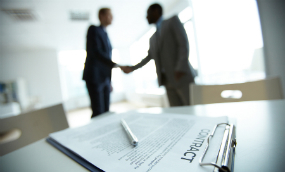 A good commercial contract is one that is clear, non-ambiguous and precise. The Daytona Beach-based business attorneys of Lankford Law Firm will go through every line of every contract before you sign it. B2B contracts are business agreements that involve at least two companies, so every possible misinterpretation or misunderstanding must be considered. This also protects your business from anyone who has dishonest intentions. Your attorney should also approve any changes, adjustments, or additions to any B2B contract. Take extra caution when someone presents you with a business contract that’s drafted by another party’s attorney. You must always have your own lawyer review the contract, as the other party’s business lawyer will typically draft the contract in a manner that offers maximum benefit to their client. In short, they’re looking after the other person’s interests, not yours. So you need a qualified business lawyer who will protect your interests. Don’t let a business agreement deteriorate into a legal catastrophe. Let Lankford Law Firm handle B2B contracts and all of your legal documents and legal needs. If you do not already have the full counsel of an experienced Central Florida business contract attorney to assist with your legal matters, offer sound legal advice and oversee other company dealings, contact Lankford Law Firm right away. Attorney Melody Lankford provide a comfortable, friendly setting for clients and potential clients to discuss their business and legal needs by setting appointments around their clients’ schedules and coming to their place of profession for meetings. Contact Lankford Law Firm to schedule a case consultation today at (850) 264-7004. Se Habla Español.